If you are having difficulty seeing your staff members on the scheduler this is most likely because they are not tagged to your location. To tag them to your location go onto the People Page, open the profile of the relevant employee and see which 'Location' they are attached to. Add the necessary location(s) by searching for a location name and checking the box. Select "Done" when completed. 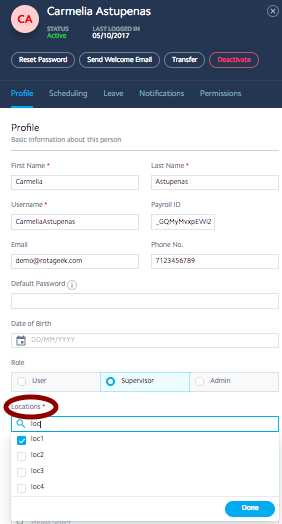 If you are unable to see the employee within the 'Employees' section, you will need to contact a colleague with Admin access to your business' Rotageek. This Admin will have access to every employee set up throughout your business, including any employees without locations attached to them. The Admin will need to search for this employee and add the required location using the above steps.